‘Crossing the Tiber’ is a phrase that has been used since the 19th century to describe the decision by an Anglican, particularly an Anglo-Catholic, who joins the Roman Catholic Church. The saying may have its origins in the term ‘crossing the Rubicon’ – the Rubicon was the boundary that no Roman general could cross with his legions. When Julius Caesar crossed this river and marched on Rome, he had made a defiant act of commitment and there was no turning back. Similarly, Anglicans who ‘cross the Tiber’ make an irrevocable commitment to the Church. Saint Peter’s Basilica and the Vatican City are on the west side of the Tiber River from classical Rome, which stands on the east side, with its famous seven hills: the Aventine, Caelian, Capitoline, Esquiline, Palatine, Quirinal and Viminal hills. The Vatican Hill, north-west of the Tiber, the Pincian Hill to the north, and the Janiculum Hill to the west, were never counted among the traditional Seven Hills of Rome. Brady was born in Dublin on 8 January 1825. His father, Sir Nicholas W Brady, was Lord Mayor of Dublin and was knighted by George IV when he visited Dublin. After graduating from Trinity College Dublin in 1848, he was appointed curate of Maynooth, and in 1849 curate of Kilkeedy, Co Limerick. In 1851, he became curate of Saint Dolough’s, Dublin, and Rector of Farrahy, Co Cork. In the same year, he also married a direct descendant of the Caroline Divine, Jeremy Taylor. Brady’s works included his three-volume Clerical and Parochial Records of Cork, Cloyne and Ross (Dublin, 1863), and he also published several works arguing for of the disestablishment of the Church of Ireland. Soon after disestablishment, Brady went to Rome to pursue research in the Vatican archives. There, in May 1873, was received into the Roman Catholic Church by Monsignor Kirby, Rector of the Irish College at Rome. In Rome, he became a private chamberlain to both Pope Pius IX and Pope Leo XIII. He wrote for the London Tablet and exchanged a lengthy correspondence with William Ewart Gladstone. He died of apoplexy in Rome on 19 March 1894, and was buried in the Campo Verano, where his grave is marked with a white marble Irish cross. A later but equally prominent Irish-born Anglican to ‘Cross the Tiber’ was George Tyrrell (1861-1909), who became a Jesuit priest but was expelled from the Jesuits because of his modernist theological scholarship. Finally he was excommunicated in 1908, and he died the following year, still seeing himself as a devout Roman Catholic. He was refused t burial in a Roman Catholic cemetery, and his priest friend, Henri Brémond, was temporarily suspended a divinis by Peter Amigo, Bishop of Southwark, because he was present at the burial made a sign of the cross over Tyrrell’s grave. I have yet to cross the Tiber on this visit to Rome. For I am staying on the west side of the Tiber, in the Hotel Franklin on Via Rodi in the Prati district, between the Vatican walls and Piazza Mazzini. I am just a few steps from the Vatican. I walked through Saint Peter’s Square yesterday and through the Vatican City several times. The queues for both the Vatican Museums and Saint Peter’s Basilica seemed to snake and curve in unending lines, so instead two of strolled along the west bank of the Tiber, through the Janiculum area, past the Villa Farnesina and the Palazzo Corsini, through the Porta Settimiana, and then continued strolling through Trastevere, with its maze of narrow cobbled backstreets, alleys and squares. This is one of the most picturesque quarters of old Rome, and we sat for a long time over a lingering lunch in the late afternoon in Tonarello, on the Via della Paglia, between Santa Maria in Trastevere and San Egidio, watching people passing by. Perhaps my favourite church in Rome is Santa Maria in Trastevere – but more about this church later. I notice in all the church I visit in Rome how they have elaborate cribs, with extensive tableaux. Although Epiphany does not arrive until Friday, the Magi have arrived in all these elaborate cribs, including the large crib in the middle of Saint Peter’s Square. Later today, I hope to cross the Tiber to the east bank of the river and visit some of the classical sites and churches in the City of the Seven Hills. I am in Rome today [4 January 2017] for a few days on a city break, visiting some important sites in Church history, and finding time too for prayer and for reflection. We are still in the Christmas season, and each morning throughout the Twelve Days of Christmas I am using the prayer diary of the Anglican mission agency, USPG (United Society Partners in the Gospel), for my morning prayers and reflections. 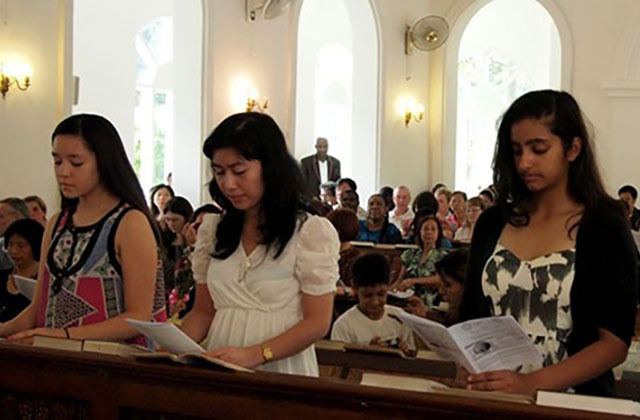 Pray for the Anglican Church of Indonesia as it establishes schools to accompany its church-planting programme. Pray for education for all children in the country and pray for the church’s youth ministry. I John 3: 7-10; Psalm 98: 1, 8-10; John 1: 35-42.